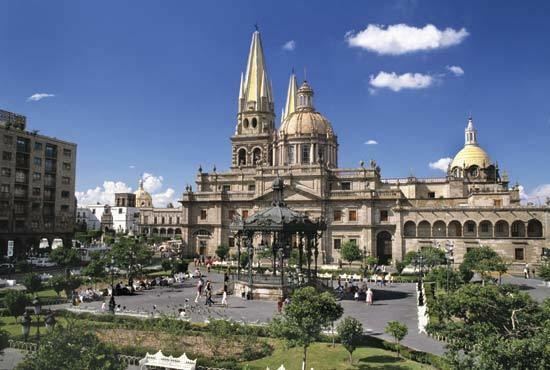 Guadalajara (, [ɡwaðalaˈxaɾa]) is the capital and largest city of the Mexican state of Jalisco, and the seat of the municipality of Guadalajara. The city is in the central region of Jalisco in the Western-Pacific area of Mexico. 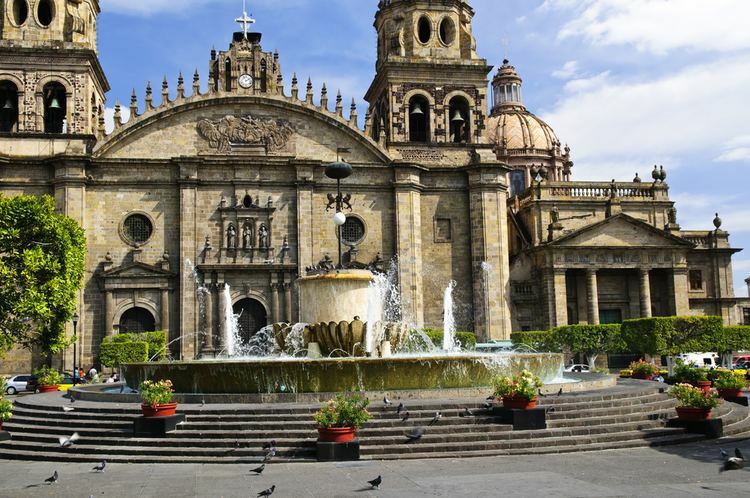 With a population of 1,495,189 it is Mexico's fourth most populous municipality. The Guadalajara Metropolitan Area includes seven adjacent municipalities with a reported population of 4,328,584 in 2009, making it the second most populous metropolitan area in Mexico, behind Mexico City. The municipality is the second most densely populated in Mexico, the first being Ciudad Nezahualcóyotl in the State of Mexico. It is a strong business and economic center in the Bajio region. Guadalajara is the 10th largest city in Latin America in population, urban area and gross domestic product. The city is named after the Spanish city of Guadalajara, the name of which came from the Andalusian Arabic wād(i) l-ḥijāra (واد الحجارة or وادي الحجارة), meaning "river/valley of stones". The city's economy is based on services and industry, especially information technology, with a large number of international firms having regional offices and manufacturing facilities in the Guadalajara Metropolitan Area, and several domestic IT companies headquartered in the city. Other, more traditional industries, such as shoes, textiles and food processing are also important contributing factors. The village of Guadalajara barely survived the war, and the villagers attributed their survival to the Archangel Michael, who remains the patron of the city. It was decided to move the city once again, this time to Atemajac, as it was more defensible. The city has remained there to this day. 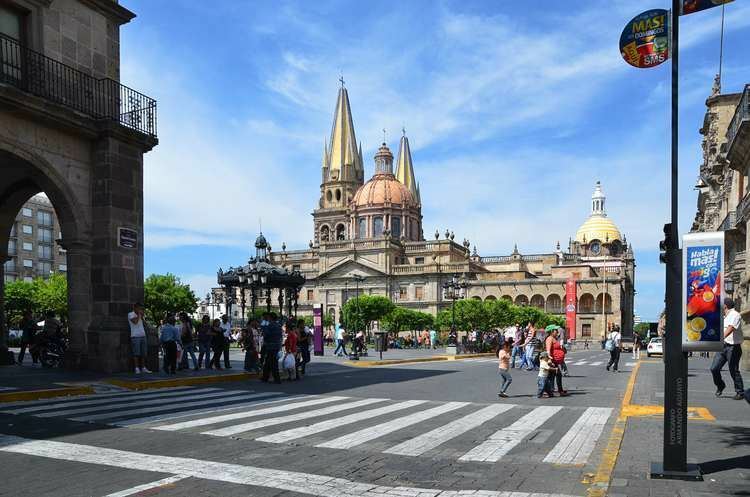 In 1542, records indicate that 126 people were living in Guadalajara and, in the same year, the status of city was granted by the king of Spain. Guadalajara was officially founded on February 14, 1550 in the Valley of Atemajac. The settlement's name came from the Spanish hometown of Nuño de Guzmán. Guadalajara again experienced substantial growth after the 1930s, and the first industrial park was established in 1947. Its population surpassed one million in 1964, and by the 1970s it was Mexico's second largest city and the largest in western Mexico. Most of the modern city's urbanization took place between the 1940s and the 1980s, with the population doubling every ten years until it stood at 2.5 million in 1980. The population of the municipality has stagnated, and even declined, slowly but steadily, since the early 1990s. The increase in population brought with it an increase in the size of what is now called Greater Guadalajara, rather than an increase in the population density of the city. Migrants coming into Guadalajara from the 1940s to the 1980s were mostly from rural areas and lived in the city center until they had enough money to buy property. This property was generally bought in the edges of the city, which were urbanizing into fraccionamientos, or residential areas. In the 1980s, it was described as a "divided city" east to west based on socioeconomic class. Since then, the city has evolved into four sectors, which are still more or less class-centered. The upper classes tend to live in Hidalgo and Juárez in the northwest and southwest, while lower classes tend to live in the city center, Libertad in the north east and southeast in Reforma. However, lower class development has developed on the city's periphery and upper and middle classes are migrating toward Zapopan, making the situation less neatly divided.(napolitano21-22). At the far east end is the Plaza de los Mariachis and the Ex-Hospicio Cabañas. The Plaza de los Mariachis is faced by restaurants where one can hear live mariachis play, especially at night. The Ex-Hospicio Cabañas extends along the entire east side of the Plaza. This building was constructed by Manuel Tolsá beginning in 1805 under orders of Carlos III. It was inaugurated and began its function as an orphanage in 1810, in spite of the fact that it would not be finished until 1845. It was named after Bishop Ruiz de Cabañas y Crespo. The façade is Neoclassical and its main entrance is topped by a triangular pediment. Today, it is the home of the Instituto Cultural Cabañas (Cabañas Cultural Institute) and its main attraction is the murals by José Clemente Orozco, which covers the main entrance hall. Among these murals is "Hombre del Fuego" (Man of Fire), considered to be one of Orozco's finest works. The city is the national leader in the development and investment of shopping malls. Many shopping centers have been built, such as Plaza Galerias, one of the largest shopping centers in Latin America, and Andares. Galerías Guadalajara covers 160,000 m2 (1,722,225.67 sq ft) and has 220 stores. It contains the two largest movie theaters in Latin America, both with IMAX screens. It hosts art exhibits and fashion shows, and has an area for cultural workshops. Anchor stores includes Liverpool and Sears and specialty stores such as Hugo Boss, Max Mara and Lacoste. Best Buy opened its first Guadalajara store here. Its has an additional private entrance on the top floor of the adjacent parking lot. Another Best Buy store was inaugurated in Ciudadela Lifestyle Center mall, which was the chain's third largest in the world, according to the company. A large segment of the commercial sector caters to tourists and other visitors. Recreational tourism is mainly concentrated in the historic downtown. In addition to being a cultural and recreational attraction and thanks to its privileged geographical location, the city serves as an axis to nearby popular beach destinations such as Puerto Vallarta, Manzanillo and Mazatlán. Other types of visitors include those who travel to attend seminars, conventions and other events in fields such as academic, entertainment, sports and business. The best-known venue for this purposes is the Expo Guadalajara, a large convention center surrounded by several hotels. It was built in 1987, and it is considered the most important convention center in Mexico. From 25 to 28 October 2015, the city was the headquarters of the first conference about the initiative of Smart Cities. Guadalajara is an important nucleus of universities and educational centers with national prestige. The most important is the Universidad de Guadalajara, which was established on October 12, 1791 by royal decree. The entity underwent a number of reorganizations since then, but the modern university as it exists today was established in 1925, when the governor of Jalisco convened professors, students and others to re-establish the university. These precepts were organized into a law called the "Ley Organica." It was ranked fifth among the best Mexican universities in 2012. Guadalajara is well connected by modern highways to Mexico City, to the northwest and to the major beach resorts of Manzanillo, Mazatlán and Puerto Vallarta. The main highways are Highway 15, which connects the city northwestward to Nogales, Sonora, via Tepic, Nayarit and eastwards to Mexico City via Morelia. Highway 80D leads northwest toward Aguascalientes, and Highway 54D leads southward to the coast via Colima. Mi Bici Pública, PBSC Urban Solutions-based public bike share system, was launched in 2014. In 2016, the city implemented 242 docking stations and 2116 bikes. The average amount of time people spend commuting with public transit in Guadalajara, for example to and from work, on a weekday is 82 min. 23% of public transit riders, ride for more than 2 hours every day. The average amount of time people wait at a stop or station for public transit is 15 min, while 22% of riders wait for over 20 minutes on average every day. The average distance people usually ride in a single trip with public transit is 8 km, while 16% travel for over 12 km in a single direction. Another dish that is strongly associated with Guadalajara is tortas ahogadas, literally "drowned tortas (sub sandwiches)." This sandwich is an oblong "bolillo" bun (made denser in Guadalajara than in the rest of the country) filled with pork and other ingredients. Then the sandwich is covered in a red tomato/chili pepper sauce. Other dishes that are popular here include pozole, a soup prepared with hominy, chicken or pork and various condiments and pipián, which is a sauce prepared with peanuts, squash and sesame seed. Bionico is a popular local dessert. The city hosts the Feria Internacional Gastronomía (International Gastronomy Fair) each year in September showcasing Mexican and international cuisines. A large number of restaurants, bars, bakeries and cafés participate as well as producers of beer, wine and tequila. The bread or bolillos mentioned above are usually called birotes in Guadalajara. They are a crusty dense baguette style bread like that associated with Italy or France and are very different from the soft bolillos found in most of the rest of Mexico. The events of this festival take place in venues all over the metropolitan area, and include a parade with floats. In August 2009, 542 mariachi musicians played together for a little over ten minutes to break the world record for largest mariachi group. The musicians played various songs ending with two classic Mexican songs "Cielito Lindo" and "Guadalajara." The feat was performed during the XVI Encuentro Internacional del Mariachi y la Charreria. The prior record was 520 musicians in 2007 in San Antonio, Texas. In the historic center of the city is the Plaza de los Mariachis, named such as many groups play here. The plaza was renovated for the 2011 Pan American Games in anticipation of the crowds visiting. Over 750 mariachi musicians play traditional melodies on the plaza, and along with the restaurants and other businesses, the plaza supports more than 830 families. A recent innovation has been the fusion of mariachi melodies and instruments with rock and roll performed by rock musicians in the Guadalajara area. An album collecting a number of these melodies was produced called "Mariachi Rock-O." There are plans to take these bands on tour in Mexico, the United States and Europe. The city is home to a renowned symphony orchestra. The Orquesta Filarmónica de Jalisco (Jalisco Philarmonic Orchestra) was founded by José Rolón in 1915. It held concerts from that time until 1924, when state funding was lost. However, the musicians kept playing to keep the orchestra alive. This eventually caught the attention of authorities and funding was restated in 1939. Private funding started in the 1940s and in 1950, an organization called Conciertos Guadalajara A. C. was formed to continue fundraising for the orchestra. In 1971, the orchestra became affiliated with the Department of Fine Arts of the State of Jalisco. The current name was adopted in 1988, as it became the orchestra for the state, not just the city of Guadalajara although it remains based here. International soloists such as Paul Badura-Skoda, Claudio Arrau, Jörg Demus, Henryck Szeryng, Nicanor Zabaleta, Plácido Domingo, Kurt Rydl and Alfred Brendel have performed with the organization. Today the orchestra is under the direction of Marco Parisotto. Guadalajara is home to four professional football teams; Guadalajara, also known as Chivas, Atlas, C.D. Oro and Universidad de Guadalajara. Guadalajara is the second most successful and the second most followed club in the country, Atlas also plays in the Mexican Primera División, due to their fine football game style of playing, they are known in the country as 'The Academy', hence they have provided Mexico's finest football players, among them: Rafael Márquez, Oswaldo Sánchez, Pável Pardo, Andrés Guardado, and Mexico national team's top scorer Jared Borgetti. Atlas, also won several Championships on Amateur Tournaments, and first Football Championship of a Guadalajara Team back in 1951. Atlas fans are collectively called La Fiel (the faithful) by themselves; younger followers are gathered as "Barra 51" ; La Barra 51 is a strong organized supporter group. His name recalls Atlas' the year of first championship in the Primera División de México in 1951. Estudiantes was associated with the Universidad Autónoma de Guadalajara A.C.. It played in the Primera División, with home games in the Estadio 3 de Marzo (March 3 Stadium, for the University's 1935 date of founding). They've won also a single Championship back in 1994 as they defeated Santos. The team moved to Zacatecas and became the Mineros de Zacatecas in May 2014. Lorena Ochoa, a retired and former #1 female golfer, Formula One driver Sergio Pérez who drives for Sahara Force India F1 Team and Javier Hernández, a forward who currently plays for West Ham United and the Mexico national team were also born in the city.